A good beginning is needed to carry you to the end. This is true of competitive things, stock car races and swimming. It is true of education, especially in mathematics and science. It is true of marriage and all intimate relationships. It is also true of ethics and our struggle to live as godly people. 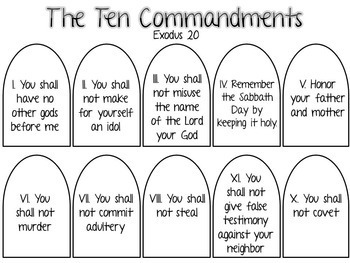 Ten commandments make a good start. Sincere believers are led from these ten commandments to the great simplification, stated by Jesus as, “Love the Lord your God with all your heart, mind, and soul; and love your neighbor as yourself.” Because I need things even simpler, I try to follow the mantra, “Always be compassionate.” But, I need to be careful here, the starting point, or good beginning, is to have no gods or idols before the one Holy God. The small group I was leading got into a side conversation about the sad state of the world. One of the folk summed it up by saying that the last of the Ten Commandments — the one about not coveting — was the hardest, and that our failure to rid our politics, our workplaces, and our personal lives of coveting was ruining everything. To covet means to yearn to possess something that you don’t, or can’t legitimately, own. It is based on the word for greed. We all have something or someone that we covet. Spirituality involves discipling our illegitimate impulses. If we don’t begin by choosing to hold the Holy God above all other idols — oh, the things we think will give our life meaning! — we will gladly exchange a little bit of heavenly mindedness for a chance to acquire what we want today. We covet things and steal. We covet other people and commit adultery. We covet freedom and betray our elderly. We covet getting ahead, and work on the Sabbath. We break all of the commandments because of our urge to covet. What breaks coveting? Loving the one true God. It is the foundation of loving the Lord our God, and honoring Him as the only Holy one, that leads us into a compassionate and right life, free of legalism.